At age 15, I had the world's best summer job working as a beach boy renting rafts, chairs and umbrellas in front of the Pavilion's board walk. I also filled in as lifeguard when needed. The next weekend, my best friend, Bernie Moore and I traveled down to Wrightsville Beach and bought surfboards. We bought Gulfwax from the Atlantic Beach Grocery Store and taught ourselves to surf the best we could. We had no other surfers to watch... to learn from. But we had all the breaks to ourselves. A few others obtained boards... David Sledge, Ray Ball, Ben Horton, Tommy Morrow (AB Surf Shop), Charles Lupton and lifeguards Alan Shelor and my cousin Bobby Webb. Our favorite spots became Sportsman's pier and those sweet wrapping rights inside the Inlet at Fort Macon. I surfed that first winter with only a vest. There were no surf shops, but there was a bicycle/dive shop in Morehead City that had a few heavy dive suits. Somehow we survived that first winter. That spring, Ben Horton, Tommy Morrow and Ted Barts opened Atlantic Beach Surf Shop in the old volunteer fire station and others began surfing with us. Notables include the Marsh brothers and future Hall of Famer, the late Buddy Pelletier. Mrs Marsh did a lot to bring credit to surfing as she formed the local ESA chapter. 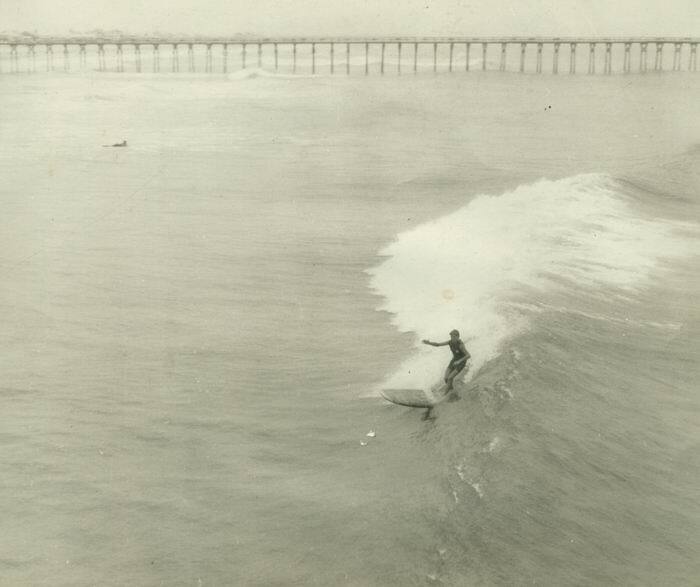 Mike Marsh was hot and later had a few great surf contest battles with Gary Propper. We enjoyed exploring new breaks that first year. We boated over to Shackleford Banks, camped for a week surfing it's legendary left handers that emptied into Ft Macon Inlet. We lived off flounder, crabs and clams. We surfed off Cape Lookout, but were spooked by large Mako Sharks feeding on migrating Spanish Mackeral. There was no road yet to Bogue Inlet, so my Mom hauled 4 of us and a tent down there one weekend (driving on the beach from the Bogue Inlet pier to the inlet). We surfed big, gnarley waves there and paddled across Bogue Inlet to explore the next island. Ah... those were the days. All I wanted to do was surf, my parents couldn't understand the attraction. In September of 1966, I was rescued by the Coast Guard when I got swept out to sea, caught in rips and building swell from passing Hurricane Faith. The next week I moved to Cocoa Beach.